Dom Roma says he has unfinished business as a player. 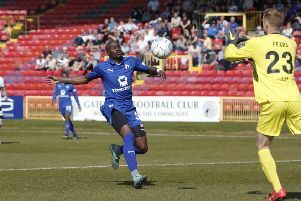 The defender, just turned 31, called time on his first taste of management with Gainsborough Trinity at the start of February due to work and family commitments. The extra demands of managing a National League North club had taken its toll on Roma who says upon reflection it was a case of the right job but a few years too soon. Roma, who clocked up his 200th league appearance for Trinity earlier this year, believes he still has a lot to offer a team and is eager to get back playing football. He said: “I’m raring to go. I feel like I’ve got unfinished business at Conference North level. I’m only 31. Up until this season I’ve been a mainstay in every team I’ve played in. “I can play in a number of positions and I feel like I’ve got a lot of unfinished business in that league now. I still want to achieve things as a footballer. “Whatever happens in management will happen when I finish playing. I want to see my kids grow up before I take a step into management again something like four years down the line. Former Sheffield United youngster Roma has made more than 500 appearances at National League North level over the past ten years and trained this week at Harrogate to maintain fitness. He said: “I feel ready. I still feel like I’ve got unfinished business at that level. I’m going to use this time now to go and get some games somewhere. Whether that might be the league below, I don’t know. And he says he can slot in anywhere along the back four. “For the last nine years I’ve played at full-back,” he said. “Last season for Gainsborough I’ve played centre-half. I’ve played a lot of my youth career at centre-half. I made my Football League debut at centre-half. “I can play anywhere across the back four. At this moment I feel like centre-half is the position I can offer the most to. But with a good pre-season under my belt and a good summer I know I can still offer quite a lot at full-back as well. He added: “As you get older your game changes and I’m not going to be bombing on as much as when I first went to Gainsborough. Roma, a PE teacher at Sheffield Springs Academy, had his player registration at Trinity cancelled this week and is looking for a fresh challenge, as a player. “I want to go somewhere where I can try and make an impact,” he said. “I don’t just want to go somewhere mid-table and play for nothing. I want a challenge, either a team in a battle or one that is trying to gain promotion. “If a manager of a football club wants me to have an input then I can give it him but I want to primarily focus on playing. I’ve had a taste of management. It was probably the right job for me but four years too early.